So I have dreams of hosting Thanksgiving dinner at my house. I love the idea of making the big meal, setting a long table, and decorating the house with festive and funky Fall items. 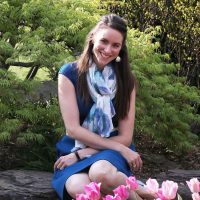 Except there are a few problems with this (excluding the biggest problem, which is naturally finding the space for my huge family to all sit and eat at the same time…): 1) I am a vegetarian so…turkey?…and 2) I don’t really like Thanksgiving food. But that’s why I love imagining new ways to offer the traditional foods! At my house growing up, we always had mashed potatoes and candied yams at Thanksgiving. If you’ve spent much time with me, you know I am rather anti-potato. I won’t get into it, except to say that if you still think potatoes count as your daily vegetables, then I think you have been deluded. 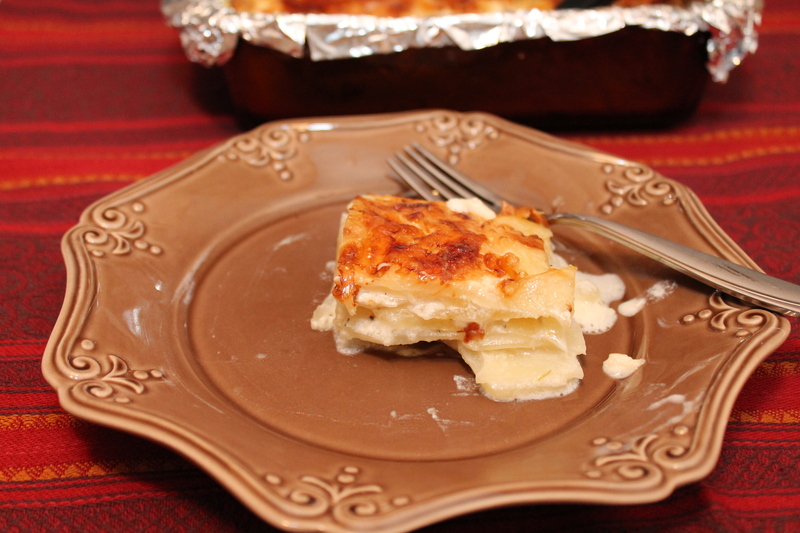 The holiday season seems like as good a time as any to put aside my potato grudge and make something delicious. Let’s view it as a splurge on the plate. I know you are not going to go through an entire Thanksgiving dinner without potatoes, so why not jazz up the boring old mashed variety and turn your potatoes into silky, creamy slices, layered high and topped with a golden, cheesy crust? Yum. This dish was very easy to make! But I have a mandoline. If you don’t, then you should get one. Otherwise you will be slicing potatoes until Black Friday. No good. Grab about 2 lbs. potatoes. I actually used CSA potatoes! I had them left over; potatoes can keep a long time in the pantry! Peel them, then quick as you please, slice them in ⅛″ slices using your mandoline. Be careful not to cut yourself! Let’s not have any Thanksgiving finger casualties. Line an 8″ square baking dish with foil and spray the foil with cooking spray. Begin layering in the potatoes. I did kind of a back and forth weaving pattern, seasoning with coarse sea salt, black pepper, and finely chopped fresh thyme and rosemary between each layer. 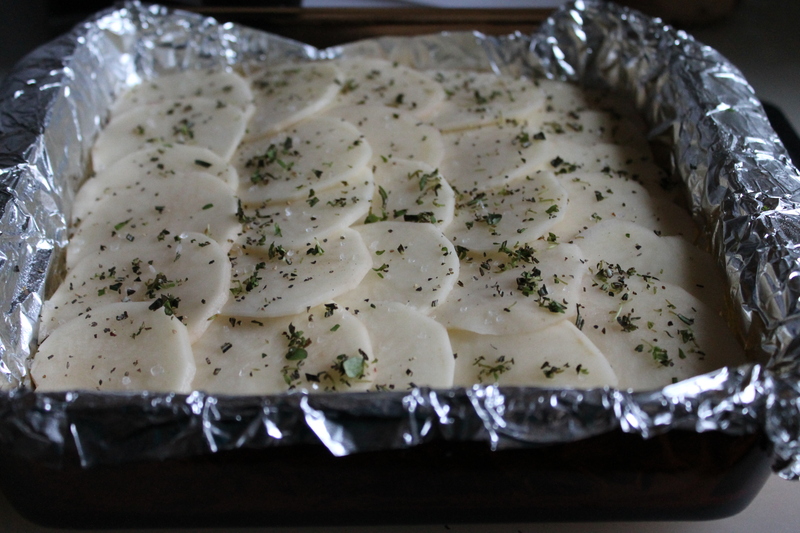 I also turned the pan between each layer, so I wasn’t putting on the potatoes in the same direction each time. I don’t know if that made the layers more even or less, but the whole thing came out great, so take that for what it’s worth! Now you need to scald the milk, cream, garlic, and nutmeg. Here’s where I admit that I think this is too much liquid! Of course, it helps to have a good covering of liquid to cook the potatoes in, but…well, it didn’t cook down or thicken in the oven. In fact, after I served the potatoes, there was a humongous pool of liquid still in the dish. Not my ideal. But what the hey! The potatoes were so delicious, I am sharing them with you anyway! Scald your milk and cream. I wrote the recipe for the full amount that I used, but if you feel inclined to decrease it a bit based on my comments, I leave that to you. And let me know how it turns out! Pour the scalded cream mixture over the layered potatoes. This will, of course, make all the seasoning on the top layer swim away. Oh well. Liberally top the potatoes with shredded cheese. I used emmenthaler and parmesan. You could use any sort of cheese you like, as long as you like it! Preheat oven to 350°. 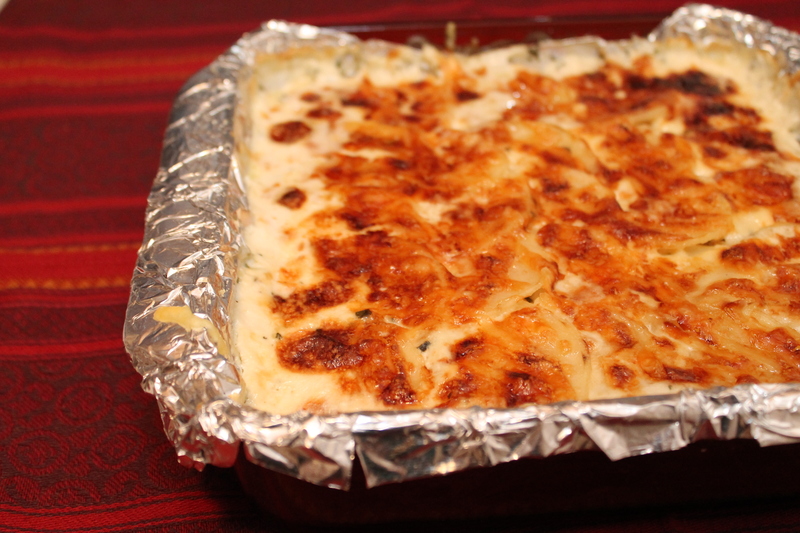 Line an 8″ square baking dish with foil and lightly grease the foil. 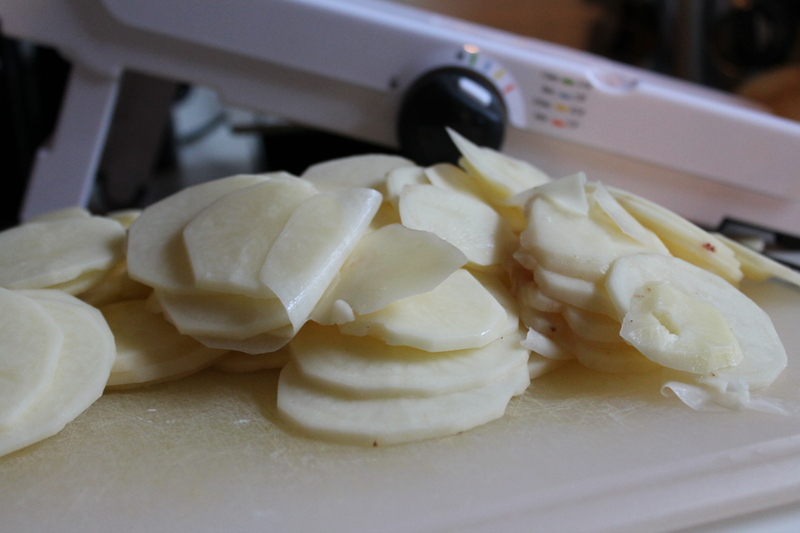 Slice the potatoes ⅛″ thick using a mandoline or a sharp chef knife. 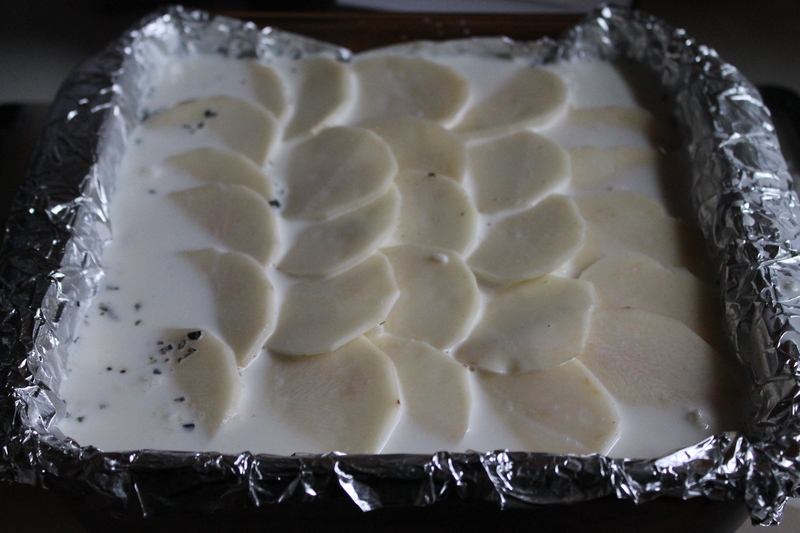 Arrange the potatoes in overlapping layers in the prepared baking dish, seasoning lightly with salt, pepper, and herbs between each layer. Combine the milk, cream, garlic, and nutmeg in a medium saucepan. Bring to a low boil, then remove from heat and pout over potatoes. Top the potatoes with the shredded cheeses. Set the baking dish with the gratin on top of a cookie sheet. 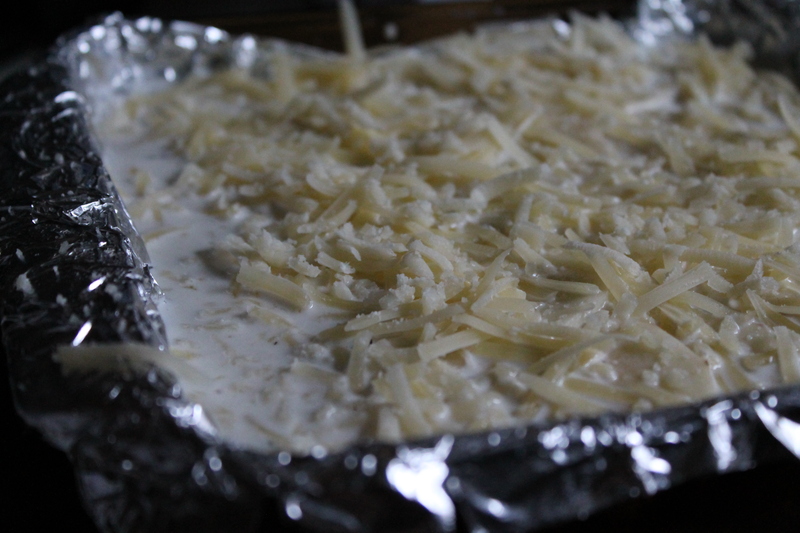 Bake for 1 hour, or until potatoes are tender and the cheese is browned on top. Cool at least 15 minutes before serving. Top with additional chopped herbs, if desired.